← RECOMMENDED: Wente Vineyards Estate Grown, 2009 “Riverbank” Riesling, Arroyo Seco / Monterey. 13% ABV. $11.99, available for as little as $8.95 online. 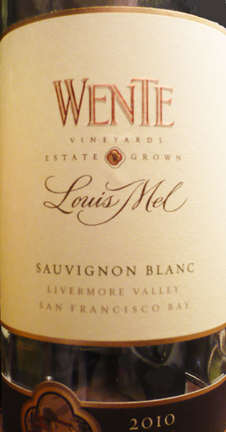 RECOMMENDED: Wente Vineyards Estate Grown, 2010 “Louis Mel” Sauvignon Blanc, Livermore Valley. 13% ABV. $11.99, available for as little as $8.43 online. APPEARANCE: Very pale golden, clear. NOSE: Pear, melon, green apple, honey, a little lemon bar. TASTE/MOUTHFEEL: A paradox: A biting mineral first impression, yet a kindler gentler Sauvignon very quickly. No asparagus, grass, or cat pee to this one! Only slightly tangy. Soft and cheerful—almost like a good Pinot Grigio. FINISH: Kind, silky, not particularly long. LABEL NOTES: Wente Vineyards, established in 1883, is the country’s oldest continuously operated family-owned winery. Louis Mel immigrated to the Livermore Valley in the 1800s and helped acquire cuttings of Sauvignon Blanc from Bordeaux’s famed Chateau d’Yquem. Descendants of these original Sauvignon Blanc cuttings are Estate Grown in the Wente family’s sustainably farmed vineyards, producing bright crisp flavors of citrus and pear. Enjoy. VINEYARD: A French emigrant, Louis Mel traveled the western United States in the 1870’s seeking a place to make wines to rival the great French Crus. He found the ideal home in the Livermore Valley. Acquiring Sauvignon Blanc and Semillon cuttings from the Marquis de Lur-Saluces, owner of the famed Chateau Y’quem, he planted them in his vineyards. The Wente family acquired the Louis Mel estate in the 1930’s, where the descendants of these vines, located in the southern Livermore Valley, live in gravel and loam soils similar to the terroir of their native Bordeaux. FERMENTATION: The grapes were fermented cold to ensure that the natural fruitiness was retained. AGING: This wine was aged in stainless steel tanks. This entry was posted in California, Sauvignon Blanc. Bookmark the permalink.